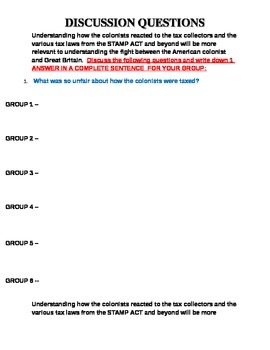 This is a 6 page Discussion Question sheet I've done in stations regarding the Stamp Act. I introduce the Stamp Act by telling the students that prices are going up soon in the cafeteria and they HAVE TO PAY or won't get lunch! I have 6 stations set up each with a question sheet about the Stamp Act. Each group must decide how and what they are going to answer before writing it down. It's a great way to get the students to communicate and discuss what is going on during this time leading to the Revolution.